Human CD19 (20-291), His Tag (CD9-H52H2) is expressed from human 293 cells (HEK293). It contains AA Pro 20 - Lys 291 (Accession # P15391-1). The protein has a calculated MW of 32.0 kDa. The protein migrates as 45-50 kDa under reducing (R) condition (SDS-PAGE) due to glycosylation. Human CD19 (20-291), His Tag on SDS-PAGE under reducing (R) condition. The gel was stained overnight with Coomassie Blue. The purity of the protein is greater than 90%. 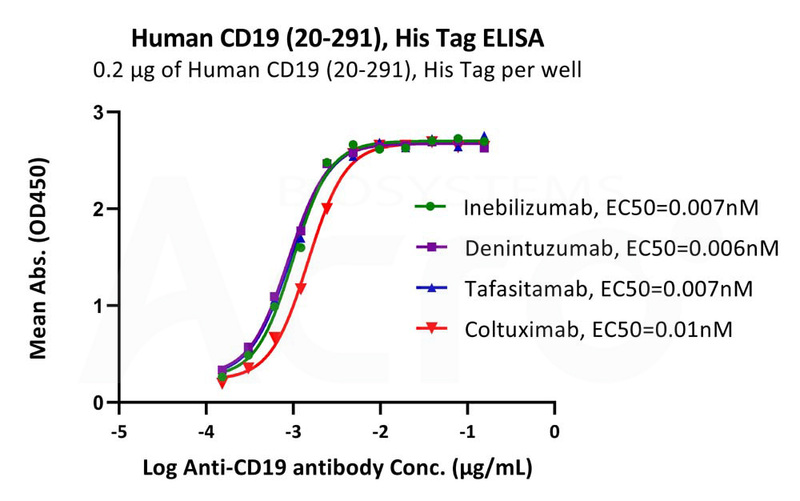 Immobilized FMC63 MAb at 2 μg/mL (100 μL/well) can bind Human CD19 (20-291), His Tag (Cat. No. CD9-H52H2) with a linear range of 10-78 ng/mL (QC tested). Immobilized Human CD19 (20-291), His Tag (Cat. No. CD9-H52H2) at 2 μg/mL (100 μL/well) on Nickel Coated Plate, can bind FMC63 (Mouse IgG2a) with a linear range of 2-13 ng/mL (Routinely tested). Immobilized Human CD19 (20-291), His Tag (Cat. No. 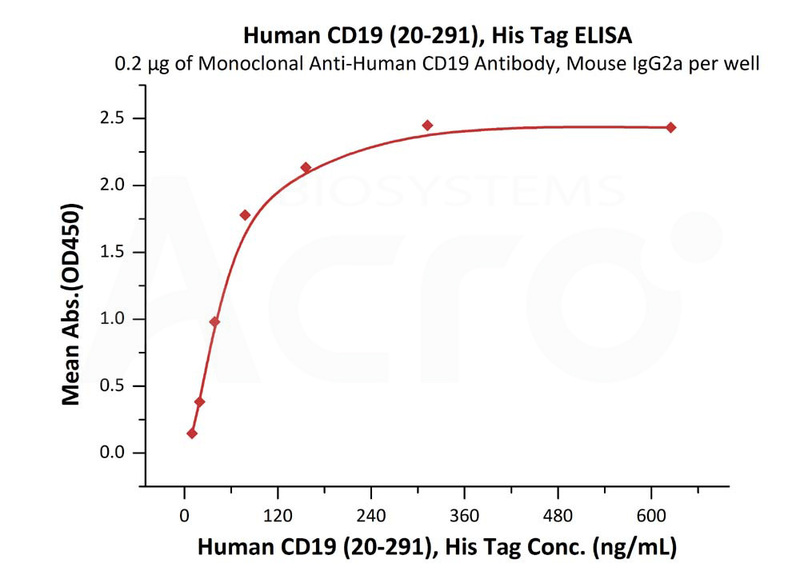 CD9-H52H2) at 0.1 μg/mL (100 μL/well) on MonRabTM Anti-His Tag (C-term) Antibody precoated (0.1 μg/well) plate, can bind FMC63 (Mouse IgG2a) with a linear range of 0.6-10 ng/mL (Routinely tested). FMC63 MAb (mouse lgG2a) captured on CM5 chip via anti-mouse antibodies surface, can bind Human CD19 (20-291), His Tag (Cat. No. CD9-H52H2) with an affinity constant of 2.95 nM as determined in a SPR assay (Biacore T200) (Routinely tested). 293 cells were transfected with FMC63-scFv and RFP tag. 2x105 of the cells were first incubated with A. His Tag-protein control. B. Recombinant human CD19 (20-291), His Tag (Cat. No. CD9-H52H2, 10 μg/ml). C. Recombinant human CD19, His Tag (Cat. No. 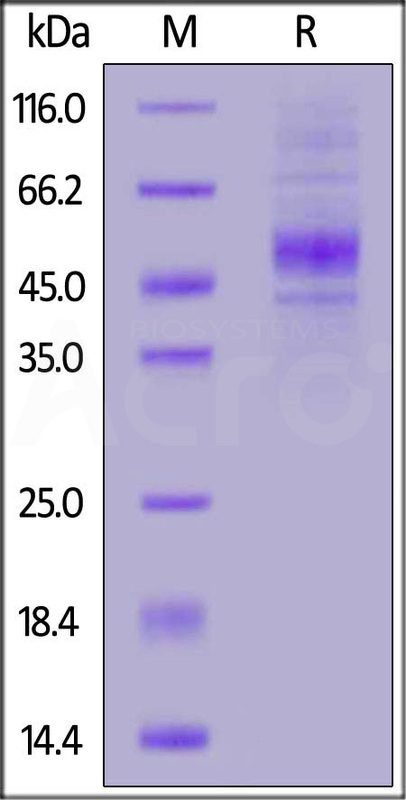 CD9-H52H2, 10 μg/ml) and FMC63 (Mouse anti-CD19 antibody). The FITC Anti-6xHis tag antibody was used to analyse with FACS. RFP was used to evaluate CAR (FMC63-scFv) expression and FITC was used to evaluate the binding activity of recombinant human CD19 (20-291), His Tag (Cat. No. CD9-H52H2).